The mosaic of states, kingdoms, duchies, and principles that made future Germany a very difficult job. As usual, I used the information for this period. Faithful to previous works, you will discover hundreds of color photos of some of the most beautiful and rare German bayonets from 1830 to 1890. You will appreciate the presence of more than 80 shots of German soldiers, mostly unpublished and of exceptional quality, illustrating the 256 pages of this book. 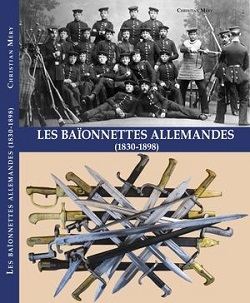 Remember that this documentation specific to German bayonets is the only one to be published in French, nevertheless, it is easily exploitable by all collectors and history buffs.